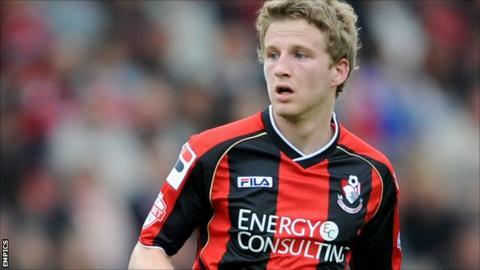 Bournemouth midfielder Eunan O'Kane says the pressure is all on Reading going into Tuesday's Championship clash between the two sides at Dean Court. Reading occupy the final play-off place with a five-point advantage over the Cherries, Nottingham Forest, Brighton and Ipswich; their closest rivals. "From our point of view the pressure is on them," O'Kane told BBC Radio Solent. "Our goal was to stay in the league, that has altered now but there is no pressure on us making the play-offs." Reading were relegated from the Premier League in the summer, while Bournemouth were promoted from League One. And the 23-year-old says both clubs have very different aspirations. "We want to and we are doing everything we can to be [in the play-offs], but ultimately the pressure is all on them," he said. "They are a big club, they pay a lot of money to their players and before the season started they were expected to go up, so I would say they have more to lose." The Cherries are on a run of four consecutive victories and have won seven of their last 10 games, while Reading's away form is strong. O'Kane also believes their 2-1 victory at the Madejski Stadium in December helped kick-start their season. "It was a statement of intent to ourselves that we are good enough to be at this level," he said. "It gave us belief and spurred us on. "We've been pretty good at home so something will have to give. They'll come here expecting to win. They need to be beating us to knock us out of it and open up a gap between us. "It'll be a good game and I hope they're ready for it."